Luscious pink and rosy lips are attractive and desired by many. Dull and dark lips, on the other hand are a bane to your beauty. They can be caused by a number of factors such as sun exposure, smoking, excessive intake of tea or coffee, hormonal imbalance, and others. To get rid of this problem, you can use an effective homemade lip balm prepared from ingredients like coconut oil, beeswax, shea butter and beetroot powder. The beetroot powder will lend a nice pink color and the beeswax, oil and shea butter will provide moisturization. Coconut oil will also help lighten your lip color. So, you can prepare a lip balm for dark lips at your home itself and use it daily. It is natural, useful, cost-effective and will last for several months. 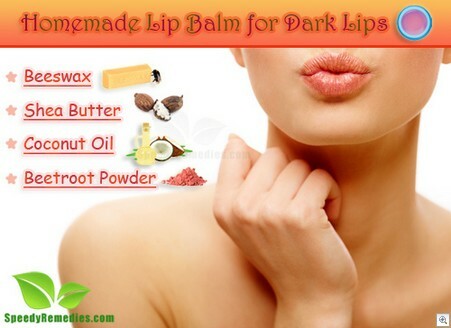 Here’s the recipe for a homemade lip balm for dark lips. A small sauce pan and a glass jar to create a double boiler. Heat two tablespoons of coconut oil in a double boiler and mix in one teaspoon of beetroot powder. When the beetroot powder starts to impart its color, turn off the heat and allow the oil to cool slightly. Strain the oil through a fine mesh cloth to get rid of particles from the beetroot powder. Next, melt two tablespoons of beeswax in the double-boiler over low heat. Mix in two tablespoons of shea butter and the infused coconut oil. When all the ingredients melt completely, remove the glass jar from heat. Stir in a few drops of peppermint oil or any other essential oil of your choice. Quickly transfer the mixture into the lip balm tubes or containers using a glass dropper. Allow it to set at least for three to four hours until it hardens completely. Store your homemade lip balm in a cool dry place. You can purchase the beetroot powder required for this recipe from the market or make it yourself at home using a dehydrator. As for the double boiler, fill a saucepan halfway with water and heat it. When the water starts boiling, place on it the glass jar in which you will be making the recipe and then proceed by adding the ingredients. Massage your lips with almond oil daily at night before going to bed and leave it on overnight. Do this daily at least for a month to lighten lip color naturally. At times, you can also mix a little lemon juice in the almond oil and use it as usual. Place a slice of beetroot in the refrigerator for some time. Gently rub it on your lips for a few minutes and leave it on for an hour or so. You could also use a combination of one-half teaspoon each of beetroot juice and pomegranate juice. Soak a cotton ball in pure rose water mixed with a little honey, gently rub it on your lips, and leave it on for a few hours. Do this on a regular basis to lighten and soften your lips. Soak a few rose petals in milk for a few hours. Next, crush the petals and a little honey and saffron to it. Apply this paste on your lips. Leave it on for 15 to 20 minutes and then rinse it off. Mash a few fresh raspberries and mix in two teaspoons of aloe vera gel and one teaspoon of honey. Apply it to your lips and leave it on for about five minutes before rinsing it off. Exfoliate your lips once or twice a week. You can prepare a natural lip scrub for this purpose by mixing together two teaspoons of sugar and one teaspoon of honey. Do not forget to apply a rich lip balm after exfoliation to moisturize your lips. This is Awesome. But is there anything i can do with just extra virgin olive oil , lime juice, sugar? or even coconut oil?